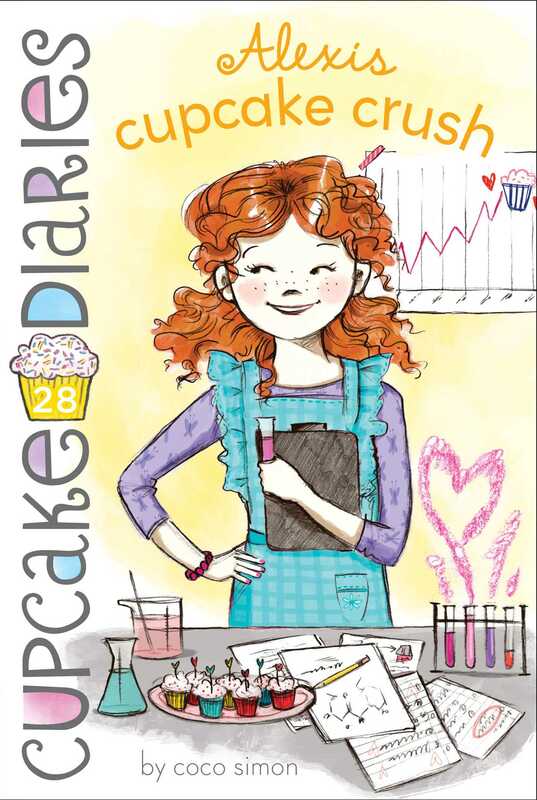 Science whiz Alexis is out to prove that cupcakes are healthy in the latest addition to the Cupcake Diaries series. Alexis thinks she has the perfect project to win the Science Fair—she’s going to prove that cupcakes are good for you! But all thoughts of the school competition go out the window when she spots her crush walking home with another girl. Maybe she should have whipped up a love potion instead! Meanwhile, the girls are challenged to make rock and roll cupcakes for Martine Donay’s sweet sixteen—and she is anything but sweet! Cupcakes with black icing, anyone? I took a big bite of a chocolate cupcake. “Mmm! Yummy! Vitamins and minerals!” I mumbled through the crumbs. But it was not yummy. Not yummy at all. “Ugh. These are horrible!” I yelled, and ran to the garbage to spit out my bite. “Sorry, Katie,” I added sheepishly. Emma and Mia laughed and Katie shook her head, but she was smiling. The Cupcake Club was helping me out—again!—with a project, but for once it was something we were all experts in: cupcakes! This time, it was my project for the science fair, and I had decided to prove that cupcakes are good for you. I know, it sounds crazy—like yet another marketing scheme of mine—but it turns out it’s true. Under certain circumstances, anyway. So, according to my research, chocolate is good for you; especially dark chocolate. It is good for your blood and liver and cholesterol, and when you eat it, it releases endorphins, which relax you and make you feel happy. So, dark chocolate cupcakes with dark chocolate frosting are a must for the science fair. It’s just a teeeeeny bit difficult to make dark chocolate taste really good without adding lots of sugar. (The bad thing about sugar is that it cancels out a lot of the healthy things about dark chocolate.) That’s why improving sugarless taste is one thing we were working on in our “test kitchen,” which was at Emma’s house today. If we can reduce the sugar and fat in our basic cupcake and frosting recipes, and up the dark chocolate, and then add fruit or veggies, then we can have a healthy recipe I can use for the science fair (not to mention samples I can hand out to the judges!). It’s just been really slow going, and honestly, it’s starting to seem like we’ll never get them to taste good. Mia’s convinced if we make them look pretty enough, people will just eat them and not care, but I disagree, and so does Emma. “It’s not about looks!” said Emma. “Easy for you to say,” I teased. Emma’s a model, and you know how really pretty people can sometimes take their looks for granted and, like, not notice them? She’s like that. I suppose it’s a good quality, but it can be kind of annoying, anyway. “You’d be surprised,” Katie said wisely. I sighed. “That’s why we pay you the big bucks, Katie. You’re the taste doctor.” I shrugged and pulled over the notebook I was using to keep track of the recipes to see what Katie had written in it. What I saw there was much more to my liking: quantities, measurements, pricing, calorie counts. . . . In a word, numbers! My favorite thing. “Six ninety-nine for one little can of sweet potatoes?” I asked incredulously. “They’re organic, and they’re pricey when they’re processed like that. You could bake and scoop your own. It would be a lot cheaper, but they might not be as smooth as the professionally pureed ones,” said Katie. The phone rang, and Emma went to answer it. She took a message and rejoined us. “I’ve heard of people even using baby food,” said Emma. “Eww! In baked goods?” I asked. “Uh-huh,” Emma said, giggling. She picked up a yucky cupcake and tried to feed it to me, like I was a baby. “Open up, Lexi . . . ,” she said in baby talk. I clamped my mouth shut and shook my head. “Come on! Yummy, yummy!” she joked, while wiggling the cupcake toward my mouth, like she was feeding a toddler. I closed my eyes and shook my head harder, and she grabbed my chin to try to force open my mouth. I started laughing, and we were play-wrestling. I fell off the stool. Right then, Emma’s brother Matt, the crush of my life, strolled in from practice. “Please don’t!” I cried, jumping to my feet. “How much is my silence worth to you?” he joked. I waved my arm at the dozen healthy (and awful) cupcakes on the counter. “These are all yours!” I said generously. Then he looked at me skeptically. “What’s the catch?” He narrowed his eyes and lifted a cupcake to inspect it. “Why would there be a catch?” I asked innocently. Matt looked at the cupcake suspiciously. He turned it all around. It was small and dense, and the dark chocolate frosting was thick and glossy. It looked delicious. Next, Matt lifted it to his nose and gave it a whiff. “Hmm. Good observation,” I agreed. We all stood with bated breath as Matt took a tentative nibble. He looked at us looking at him, and his brow furrowed. “It’s . . .” He was about to say “good,” but then the lack of sugar hit him. He spun and hurried to the garbage and spat his cupcake on top of mine. “Blech! Who forgot the sugar? !” he cried. “They’re healthy cupcakes. They’re good for you!” I chirped. “They’re my project for the science fair. You’re our guinea pig,” I admitted. Mia waved and I laughed again. “Oh. Well, that should be a winner,” said Matt, but he didn’t sound superenthusiastic. He hoisted his backpack onto his shoulder and turned to go up to his room. “Sam Perry called,” Emma said as he retreated. “Who?” Matt turned back around. “Who’s Sam Perry?” I asked. Matt had a funny look on his face that I couldn’t read. “New at school,” he said, and he wandered off. “Who’s Sam Perry?” I repeated to Emma when Matt was out of earshot. “I have no idea,” she said, looking at her nails. “Weird. Never heard of him,” I said. I wondered briefly why Matt had acted so odd. But maybe I was just imagining things. Katie made a third batter now, opening the jar of applesauce and measuring out the proper amount. I like applesauce (much more than sweet potatoes), so I had high hopes for this batch. Meanwhile, we needed to start brainstorming about our real work, the kind that earns money. My favorite kind! “Cool. That could be fun. Just for starters, I’m thinking all pink and ruffly, like a quinceañera,” said Mia, referencing the Latina rite of passage she was looking forward to in her own life. “Whose party is it?” asked Katie. “Um, Martine Donay?” I wasn’t sure I was pronouncing the name right. I’d never heard of her. Katie and I exchanged a worried glance. “Um, yeah?” I said. “She’s a friend of Dan’s, for starters,” said Mia, referring to her stepbrother, who’s a heavy-metal music nut. “Oh,” I said. That told me a lot. “Well, it was her mother who contacted us,” I said, looking at my notes. I made a note in the ledger and agreed to contact Mrs. Donay and set up a meeting. “Anything else lined up for that weekend?” asked Katie. “Live and learn, that’s one of my mottoes,” I said with a shrug. “Oh, Alexis, what isn’t one of your mottoes?” teased Mia. “It does help to have organizing principles, you know,” I said with a sniff, but I was really only pretending to be annoyed. I know my friends love me and all my quirkiness. That’s why the Cupcake Club is so much fun. I get to totally relax and be my true self with these three girls. “Cute!” said Mia. We all nodded. “Any other Cupcake business?” asked Emma. “Cool! Thanks! I’ll tell him,” said Emma. Matt is very talented at graphic design and computer stuff. We’ve used him for posters and flyers and mailings and more, and we’ve always been really impressed by his talent. I especially like using him for projects ’cause then I get to hang out with him more and it gives me an excuse to text/e-mail/call him! It’s pretty cool how far we’ve come as a business from when we first started, and I’m not saying that to brag just ’cause I’m the CEO. I like thinking about things like mission statements and profit-and-loss sheets; these are the things I work on in the Future Business Leaders of America, a club at school, and they always come in handy in real life. “Just do a quick thing at the top, like, ‘Four stylish friends plus professional baking experience times good taste equals the Cupcake Club,’?” suggested Mia. “That is awesome!” I replied, writing as fast as I could to get it all down. I love math, so any math-themed thing is up my alley. “?‘A splash of zest’!” added Emma. “?‘Makes: one great party treat’!” I added. “That’s so good. I love it,” Mia said, grinning. “What about your equation idea, though? I loved that too,” I said. “How much longer on these cupcakes?” asked Mia. “I hope these work!” I said nervously. “No offense,” I added. We cleaned up and chatted, and soon the cupcakes were out of the oven and frosted. Katie arranged them on two plates, and we all sampled one of each. I tried the applesauce first, cautiously this time. The texture was good; they were nice and moist. I rolled the bite around in my mouth and found it pleasantly sweet—not overly so (like a regular cupcake) but pretty darn good! “Hey! The applesauce ones are pretty good!” I said in surprise. I made a face—ew, sweet potato puree—but I reached for one and then popped a bite into my mouth. She was right! Any chance to see Matt! “Sure!” I agreed. “They’re not that picky, remember,” warned Emma. “Hey, boys!” she yelled. Soon, Emma’s brothers—Jake, Matt, and Sam—were thundering into the kitchen, and the cupcakes were quickly depleted. They resoundingly voted for the sweet potato version, and Katie decided to reuse the applesauce concept as a new healthy apple-cinnamon recipe for the fall. “Are these really good for me?” Jake asked, not believing us. I looked at my friends. “That’s just the reaction we were hoping for!” We all high-fived.